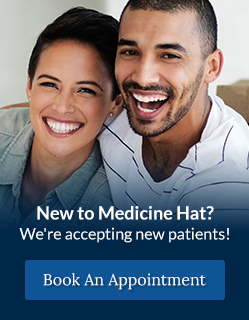 At River Dental in Medicine Hat, we're always here to answer your frequently asked questions (FAQs) about our dental services. We know that many patients are apprehensive about receiving dental care. At River Dental Clinic, we pride ourselves in our ability to make each patient as comfortable as possible while receiving care. What is our Sedation Dental Care Program? Many of our patients prefer the comfort of sedation when undergoing long or complex procedures. River Dental Clinic offers a special Sedation Care Program wherein qualified patients can just take a small pill and be sedated while having all of their dental needs taken care of. What is an anesthetic injection? Most of our patients never know they have received an injection. That’s because a topical anesthetic is applied to the tissue with a swab. This anesthetic numbs the spot where the doctor will give you a gentle injection. How is post-treatment comfort managed? We want you to be as comfortable as possible after your care. We often send our patients home with a supply of non-narcotic analgesics to relieve any post treatment discomfort. These include aspirin, acetaminophen and non-steroidal anti-inflammatory drugs such as Ibuprofen. For more involved procedures, a narcotic analgesic may be prescribed for your comfort. Every patient is different, but we strive to ensure you feel little to no pain. Depending on your dental treatment you will snooze between two and six hours. Are pregnant women at risk for gum and dental disease? Many mothers have experienced gum disease, dental pain and/or tooth extraction during or shortly after pregnancy. This is often seen as being a “normal” side effect of being pregnant. However, dental disease is never “normal”. Hormonal changes may make the gums more susceptible to disease. Pregnant women eat smaller, more frequent meals, exposing their teeth and gums to sugars and acids more often. Cravings for “junk foods” and inadequate oral hygiene pose an increased threat to the teeth and gums. How can I maintain good dental health during pregnancy? Pregnant women should be advised to schedule a dental evaluation and receive preventive dental care. It’s a good habit to start early. The teeth must be cleaned as they erupt. Use a damp wash cloth or a toothbrush. If your health care provider agrees, use a tiny dab of fluoride toothpaste. Sore gums from teething often occur for a few days at a time between six months to age three. Babies often get relief from a clean teething ring, cool spoon, cold wet washcloth or toothbrush. “First visit by first birthday” sums it up. Your child should visit a dentist when the first tooth comes in, usually between six and twelve months of age. What dental problems could a baby have? Dental problems can begin early. A big concern is Baby Bottle Tooth Decay (BBTD), which is preventable. BBTD can result from long periods of exposing baby teeth to liquids that contain sugar including formula, milk, breast milk, and juice. Frequent snacking and the habit of sleeping with a baby bottle filled with any sugary liquid or a breast in their mouth is at risk of getting BBTD. How can I prevent tooth decay from nursing or a bottle? Taking your baby off the breast when he/she falls asleep can prevent baby tooth decay. Hold your baby while bottle feeding. Always take a bottle filled with milk or juice away from the sleeping child. Should I worry about thumb or finger sucking? Thumb sucking is perfectly normal for infants; most stop by the age of two. Prolonged (beyond age 5 or 6 years) thumb sucking can create crowded, crooked teeth or bite problems. What are the signs of decayed baby erupting teeth (bottle caries)? Wiping the child’s gums and teeth with a soft cloth before being put to bed can help prevent decay. Are there ways to improve the look of my teeth? One of the first things people notice is your smile. If you are unsatisfied with chipped, stained, or crooked teeth, you may consider cosmetic procedures. How long does it take to make my smile for aesthetically appealing? Each patient is different. Depending on your specific case, there are many different procedures that can help give you a brighter, healthier and natural looking smile. Are there ways to avoid pain and needles at the dentist? What is the treatment for bad breath (Halitosis)? While bad breath might be a symptom of a different disorder, it most likely stems from dental decay and periodontal disease. Periodontal disease is a disease affecting gums and bone that support the teeth. The irritated gums pull away from the teeth and form pockets between the teeth and the gums. These pockets fill with bacteria and pus which give off a foul odor. If gum disease and/or dental decay is diagnosed after a complete dental evaluation, the infection and bad breath can be treated. What is proper first aid for dental emergencies? If it is out of its socket completely and unattached, but still in the victim’s mouth, it is best to have the person hold it there, if possible, until a dentist can attempt re-implantation. If it is out of the mouth, do not let it dry out. Handle it as little as possible. Do not attempt to disinfect the tooth, or scrub it, or remove any tissue attached to it. What should I know about infection control and joint replacements? Thorough dental examination for presence of tooth and gum infection prior to joint replacement. Periodontal disease is a commonly occurring oral infection of the adult population (80% of adults are affected) destroying the bony support of the teeth. This infection slowly progresses over the lifetime of the patient and is often manifested in the advanced stage in the senior population. Who is a candidate for joint replacements? Candidates for joint replacements who have not been seen by a dentist in over a year should be considered for a thorough dental evaluation of their teeth and gums before surgery. How long will it take to treat a gum infection? How do you ensure patient protection from AIDS? A recent survey of dental patients showed that patient protection was #1 on their list of concerns about dental care. Some patients have even quit going to the dentist because of their fears. We have responded by adopting “universal (or standard) precautions”. These involve sterilizing all instruments in dry-heat ovens or steam autoclaves to kill any bacteria. Disposable items are used whenever possible. The first stage is called “gingivitis” and is characterized by gum tissue that is red, puffy, and bleeds easily when touched with a toothbrush, floss or dental instrument. The second, third, and fourth stages are initial, moderate, and advanced “periodontal disease”, respectively. These stages are different from gingivitis because the infection has destroyed the bone supporting the teeth, causing eventual tooth loss. The treatment is more involved at these stages, usually consisting of a special cleaning with anesthesia and sometimes gum surgery. If you suspect you have gum disease, please visit your dentist. Periodontal disease can go on for years without pain and without detection unless specific examination procedures are performed. Visual oral examination by itself (even by a dentist) will not reliably detect periodontal disease until it has reached an advanced stage. Early detection and adequate diagnosis require measurement of pockets (the crevice between the tooth and gum) with a periodontal probe and appropriate x-rays. Effective prevention and treatment is available, but the damage caused as the disease progresses is irreversible. Early detection and treatment is critical to prevent tooth loss and disfigurement. Although the procedure is simple, painless and requires only a few minutes, millions of American adults have never had it done. Signs of periodontal disease are bleeding gums, redness of gum tissue, swelling of gums around the teeth, breath odor, receding gums, mobility of teeth. How can complications due to cancer treatment be avoided? It is recommended that whenever possible, a pre-therapy dental evaluation with a full set of mouth x-rays be performed. Any decay, gum disease and abscesses should be treated, if time permits, prior to chemotherapy and/or radiation therapy. Even patients who have no pain or dental disorders need a thorough cleaning. The goal should be to have the patient’s mouth in optimal health prior to beginning anti-cancer therapy. What is Sleep Apnea and how can it be managed? Sleep apnea is a potentially dangerous disorder with fairly benign symptoms such as loud snoring at night, morning headaches or daytime bouts of sleepiness. The cause? Intermittent periods throughout sleep when you actually stop breathing. In the morning, the build-up of carbon dioxide in the blood causes headaches. The lack of deep, relaxing sleep can leave one drowsy and usually grouchy, during the day. During sleep apnea, the upper air passages in the mouth and throat are obstructed. One form of treatment that has proven successful is wearing an acrylic appliance during sleep to keep air passages open. It’s convenient and easy to use. Don't see the answer to your question here? Get in touch! Fill out the form below with your question, and a member of our team will be in touch with an answer!